Lactic acid bacteria (LAB) are among the most widely used microorganisms in food fermentation. However, some LAB species can also be used as live vehicles for the in situ delivery of therapeutic molecules to the mucosa of the human gastrointestinal tract (GIT). Many LAB species have ‘qualified presumption of safety’ status and survive passage through the GIT. Indeed, some are part of the usual GIT microbiota. These are appropriate candidates for the in situ production of recombinant prophylactic and therapeutic proteins. Live recombinant LAB that produce microbial antigens have been shown to elicit an immune response that confers protection against the corresponding pathogens; these LAB could therefore be used as oral vaccines. In addition, some LAB have been genetically engineered to produce therapeutic, neutralizing antibodies. The variable domain of heavy-chain-only antibodies from camelids – known as VHH antibodies or nanobodies – has peculiar properties (nanoscale size, robust structure, acid resistance, high affinity and specificity, easily produced in bacteria, etc.) that make them ideal choices as LAB-produced immunotherapeutic agents. The present review examines the advantages offered by LAB for the in situ production of therapeutic proteins in the human GIT, discusses the use of in situ produced VHH antibody fragments, and assesses the usefulness of this strategy in the treatment of infectious and non-infectious gastrointestinal diseases. New therapeutic strategies are needed if we are to better face the challenges posed by cancer, resistance to antibiotics, and viral infections. The development of systems that allow drugs to be more precisely delivered to their target organs, and that better control their release, is a major goal (Wells, 2011; Hosseinidoust et al., 2016); non-specific drug delivery can be associated with toxic side effects in non-target tissues and organs. It has been proposed that live bacteria be used as vectors for the in situ delivery of recombinant proteins for prophylactic and therapeutic purposes (Medina and Guzman, 2001; Wells and Mercenier, 2008; Cano-Garrido et al., 2015; Hosseinidoust et al., 2016; Ding et al., 2018). This strategy should be inexpensive since bacteria are easy to grow, the pharmaceutical production and purification of the active agent are avoided, and degradation problems (which are particularly severe in the gastrointestinal tract [GIT]) can be overcome (Wells, 2011; Wang et al., 2016). The producing bacteria can also be lyophilized, avoiding the need to maintain a cold chain (Pant et al., 2006). Attenuated pathogenic bacteria were originally proposed for use in such systems, but lactic acid bacteria (LAB) quickly became recognized as ideal candidates, especially for the prevention and treatment of mucosal diseases (Cano-Garrido et al., 2015; Wang et al., 2016). The LAB form a heterogeneous group of Gram-positive bacteria that include technologically important species of the genera Lactobacillus, Lactococcus, Streptococcus, Leuconostoc, Oenococcus, and Pediococcus. They are mainly characterized by their ability to produce lactic acid from sugar – an ability long exploited by humans to produce fermented foods such as cheese, yoghurt, sausage, wine, sauerkraut, and pickled vegetables. Such foods can be safely consumed long after they are made and may even be of enhanced nutritional value. The presence of LAB in foods and their lack of pathogenic traits or association with any foodborne disease have led to their being regarded as safe. In fact, most LAB species are ‘generally regarded as safe’ (GRAS) by the US Food and Drug Administration (FDA) and have been awarded ‘qualified presumption of safety’ (QPS) status by the European Food Safety Authority (EFSA). LAB occupy a wide range of niches. Some species are found in milk and in plants, while others are common members of the endogenous microbiota associated with the oral, urogenital, and GIT mucosae in animals and humans (Klaenhammer et al., 2002). Certain LAB strains play a role in controlling the intestinal microbiota, restoring the intestinal barrier function, and alleviating the inflammatory responses associated with GIT disease. This has fomented their use in the treatment and prevention of various intestinal disorders (Ouwehand et al., 2002; Isolauri et al., 2004; Gareau et al., 2010). Certain LAB groups, such as the lactobacilli, are important members of the endogenous microbiota of human mucosal surfaces, where they play crucial roles in homeostasis, providing the protection against pathogenic bacteria and stimulating the immune system (Isolauri et al., 2004; Bernardeau et al., 2008). Given their beneficial nature, LAB species such as Lactobacillus acidophilus, Lactobacillus casei, and Lactobacillus rhamnosus, which meet the definition of probiotics (FAO/WHO, 2006), have been added to food to provide consumers with their health benefits (Saxelin et al., 2005; Gareau et al., 2010; Salminen et al., 2010). Indeed, LAB, and lactobacilli in particular, have become a focus of interest for use in human and animal biomedical applications (Wells and Mercenier, 2008; Behnsen et al., 2013; Cano-Garrido et al., 2015; Wang et al., 2016). LAB are reported to be ideal candidates as live delivery vehicles for releasing therapeutic and prophylactic molecules directly at the oral, nasal, and genital mucosae and to be a realistic option for the treatment of human and animal diseases (Cano-Garrido et al., 2015; Piñero-Lambea et al., 2015; Wang et al., 2016). The safety status of the LAB, the ability of some strains to survive passage through the GIT (Vesa et al., 2000), and the capacity of some species (e.g., L. rhamnosus , Bifidobacterium animalis, and Lactobacillus plantarum) to remain viable in the GIT for a period of time render food-grade LAB ideal vehicles for delivering and even producing therapeutic molecules in situ at the GIT mucosa (Daniel et al., 2011; Wang et al., 2016). The absence of lipopolysaccharides (LPSs) in their cell walls (which is not the case in Gram-negative bacteria such as Escherichia coli ) is a further advantage, allowing them to be administered orally without the risk of endotoxic shock (Szatraj et al., 2017). In addition, the oral administration of therapeutic molecules via live recombinant LAB is a suitable alternative to invasive administration methods, for example, parenteral or subcutaneous injection, avoiding their potential side effects. Further, it circumvents the degradation of orally administered naked molecules in the digestive tract and ensures the production of the therapeutic protein at the GIT mucosa (Wang et al., 2016). Moreover, the in vivo synthesis of the therapeutic molecule reduces the dose required when compared to systemic or subcutaneous treatment (Steidler et al., 2000; Cano-Garrido et al., 2015). In recent decades, much effort has gone into the genetic manipulation of LAB with the aim of producing recombinant therapeutic molecules (García-Fruitós, 2012; Cano-Garrido et al., 2015). Tools that allow cloning, the modulation of expression, and even the localization of recombinant proteins are now available (de Ruyter et al., 1996; Martin et al., 2000, 2011; Hanniffy et al., 2004; Benbouziane et al., 2013; Linares et al., 2014; Linares et al., 2015; Michon et al., 2016). Recombinant proteins can be engineered to be secreted into the extracellular environment or to be secreted and then anchored on the bacterial surface. Proteins to be secreted must have an N-terminus signal peptide recognized by the bacterial secretion machinery. One of the secretion mechanisms most studied in genetic engineering is the Sec-dependent pathway (Mathiesen et al., 2008). This drives the translocation of the precursor protein (i.e., the signal peptide plus the mature protein) across the plasma membrane. Either during or after translocation, a signal peptidase cleaves off the signal peptide and the mature protein is released into the extracellular environment (Schneewind and Missiakas, 2014). Different signal peptides have been exploited for engineered secretion in LAB, such as that associated with the major lactococcal secreted protein Usp45 (Dieye et al., 2001), the Lactobacillus brevis S-layer protein (SlpA) (Oh et al., 2007), the Streptococcus pyogenes M6 protein (Hols et al., 1997), and the Lactobacillus crispatus aggregation-promoting factor (APF) (Martin et al., 2011; Pant et al., 2011; Gunaydin et al., 2014), among others (Mathiesen et al., 2008). Secreted recombinant proteins can also be engineered by the translational fusion of an anchor peptide (displayed on the bacterial surface) via covalent or non-covalent bonding (Desvaux et al., 2006; Zadravec et al., 2015; Mao et al., 2016; Michon et al., 2016). Indeed, several anchoring peptides derived from surface-exposed proteins of Gram-positive bacteria have been used to bind secreted recombinant proteins to the surface of LAB – either to the plasma membrane or to the cell wall components (Michon et al., 2016). The signals used to anchor the protein to the cell membrane include N-terminal transmembrane helix anchors, for example, the transmembrane domain of the PgsA protein from Bacillus subtilis (Narita et al., 2006), and lipoprotein anchor domains, for example, the anchor domain of lactococcal basic membrane protein A (BmpA) (Zadravec et al., 2014). Recombinant proteins can be covalently anchored to the bacterial cell wall, which is usually achieved by fusing the target protein to an LPXTG-type cell wall-sorting signal. This consists of an LPXTG motif followed by a C-terminal hydrophobic domain and a positively charged tail that adequately orientates the protein in the membrane, allowing a membrane-anchored sortase to cut a peptide bond of the LPXTG motif and catalyze covalent bonding with the peptidoglycan (Schneewind et al., 1993; Siegel et al., 2017). The LPXTG anchors used include the cell-wall anchor of the S. pyogenes M6 protein (Dieye et al., 2001; Cortes-Perez et al., 2003), the anchor sequence of proteinase P of Lactobacillus zeae (Kruger et al., 2002; Martin et al., 2011), and the LPXTG anchor of the cell wall surface adherent protein Lp_2578 produced by L. plantarum WCFS1 (Fredriksen et al., 2010). Recombinant proteins may also be non-covalently attached to the cell wall of LAB by fusing them to different cell wall-binding domains such as the anchoring system of the APF of L. crispatus (Martin et al., 2011), the lysin motif (LysM) (Fredriksen et al., 2012), and the C-terminal region of S-layer proteins (Hu et al., 2011). Thanks to these genetic tools, a large number of recombinant LAB strains have been designed that produce therapeutic or prophylactic proteins (Wells and Mercenier, 2008; Bermudez-Humaran et al., 2011; Daniel et al., 2011; Cano-Garrido et al., 2015; Wang et al., 2016). Some LAB are natural components of the GIT microbiota. Strains such as L. rhamnosus GG and B. animalis BB12 have been used as probiotics for modulating the GIT microbiota and even to treat some intestinal disorders (Gerritsen et al., 2011). The earliest use of therapeutic molecule-producing recombinant LAB was in the treatment of GIT inflammatory diseases and bacterial and viral infections. The literature now contains many articles describing LAB genetically engineered to produce therapeutic proteins for use in the treatment of gastrointestinal disease (Bermudez-Humaran et al., 2011; Cano-Garrido et al., 2015; Mays and Nair, 2018). Many recombinant LAB have been developed to fight inflammatory bowel disease (IBD), a group of disorders that cause chronic inflammation in different parts of the GIT. Crohn’s disease and ulcerative colitis are the two most important types. Almost two decades ago, a recombinant strain of Lactococcus lactis was engineered to secrete the anti-inflammatory interleukin 10 (IL-10) (Steidler et al., 2000), and when administered orally, it reduced colitis in two mouse models (mice treated with dextran sulfate sodium [DDS] and IL-10 −/− mice). The success obtained led the authors to continue their research with the aim of performing clinical trials, and they developed a biocontained L. lactis producing IL-10 in which the host thymidylate synthase gene (thyA) was replaced by a synthetic human IL-10 gene. Since thyA is essential for the growth of L. lactis, the viability of the biocontained strain depended on the presence of thymidine or thymine (Steidler et al., 2003). A Phase I clinical trial involving patients with Crohn’s disease reported reduced disease activity and confirmed the strain’s biocontainment, safety, and tolerability (Braat et al., 2006). Other recombinant LAB strains designed for the oral delivery of anti-inflammatory molecules to the gut have also been reported to prevent or reduce inflammation in different murine models of colitis (Cano-Garrido et al., 2015; Wang et al., 2016). For example, L. lactis strains were engineered to produce the immunomodulatory low calcium response V (LcrV) protein of Yersinia pseudotuberculosis (Foligne et al., 2007), the cytoprotective trefoil factor (TFF) (Vandenbroucke et al., 2004), the immunosuppressive cytokine interleukin 27 (IL-27) (Hanson et al., 2014), insulin-like growth factor I (IGF-I) (Liu et al., 2016), heat shock protein 65 (Hsp65) (Gomes-Santos et al., 2017), and serine protease inhibitors (Bermudez-Humaran et al., 2015). Recombinant L. casei producing superoxide dismutase has also been designed (Watterlot et al., 2010). Celiac disease, an autoimmune disorder of genetically pre-disposed individuals, also causes bowel inflammation after the ingestion of gluten. The oral administration of live recombinant LAB producing prolyl endopeptidases – enzymes that degrade the immunotoxic peptides of gluten – might be a way of preventing an inflammatory response (Alvarez-Sieiro et al., 2014). A generated food-grade recombinant L. casei strain was reported to stably and constitutively secrete a prolyl endopeptidase able to break down the 33-mer peptide of gluten (one of the most immunotoxic). The strain also resisted deactivation under simulated gastrointestinal conditions in an in vitro model with its ability to secrete the enzyme intact (Alvarez-Sieiro et al., 2014). One of the most extended uses of recombinant LAB that produce therapeutic or prophylactic molecules is as live mucosal vaccines (Wells and Mercenier, 2008; Wyszynska et al., 2015; Szatraj et al., 2017). In addition to the already mentioned advantages of LAB as live mucosal delivery vehicles, these microorganisms have additional properties that render them good choices as live vaccine vectors for mucosal vaccination. For instance, some LAB strains show innate immunoadjuvant properties that enhance the immune response provoked by the desired heterologous immunogenic molecule (Hanniffy et al., 2004; Mohamadzadeh and Klaenhammer, 2008; Bermudez-Humaran et al., 2011). In addition, they have the potential to elicit antigen-specific cellular, mucosal, and systemic humoral immune responses (del Rio et al., 2008, 2010; Wells and Mercenier, 2008; Bermudez-Humaran et al., 2011). Further, live recombinant LAB allow for immunization via the oral route, enabling the production in vivo of the therapeutic or prophylactic molecules at the GIT mucosa and avoiding the degradation of the treatment molecule in the harsh environment of the stomach (Wang et al., 2016). Moreover, administration is non-invasive and can be performed by personnel with relatively low-level training. There are neither any needles nor syringes to dispose of. It is therefore an ideal strategy for large-scale immunization programs (del Rio et al., 2014). Finally, the possibility of storing recombinant lyophilized LAB avoids the need for a cold chain, making these types of vaccine suitable for use in developing countries. Recombinant LAB that produce microbial antigens have been proposed as oral vaccines against a range of pathogens. Back in 1993, L. lactis was engineered to express fragment C of the tetanus toxin (TTFC) (Wells et al., 1993). Further studies showed that the administration of TTFC-expressing recombinant L. lactis via either the nasal (Norton et al., 1997) or the oral route (Robinson et al., 1997) protected mice against a lethal challenge with tetanus toxin. Since then, a large number of recombinant LAB strains have been generated as potential mucosal vaccines to prevent infections caused by other pathogens (Wells, 2011; Wang et al., 2016). Several recombinant LAB orally administered in appropriate animal models were reported to confer in vivo protection against infections of the GIT caused by Helicobacter pylori (Gu et al., 2009; Hongying et al., 2014; Li et al., 2014), enterohemorrhagic Escherichia coli (EHEC) (Ahmed et al., 2014), enterotoxigenic E. coli (ETEC) (Liu et al., 2009; Wei et al., 2010; Wen et al., 2012), Clostridium difficile (Yang et al., 2013; Guo et al., 2015), Salmonella enterica (Kajikawa et al., 2007), rotavirus (Marelli et al., 2011), the yeast Candida albicans (Shibasaki et al., 2014), and even parasites such as Plasmodium yoelii (Zhang et al., 2005) and Giardia lamblia (Lee et al., 2009). Peptide allergen-producing LAB have also been proposed as a therapeutic option for the treatment of peanut (Ren et al., 2014) and cow’s milk allergies (Adel-Patient et al., 2005). LAB might also be used to produce antibodies to generate passive immunity. Passive immunity, which involves the transfer of ready-to-act antibodies, occurs naturally when maternal antibodies are transferred to the fetus through the placenta, and during lactation. However, it can be artificially induced by transferring large numbers of pathogen- or toxin-specific antibodies to a non-immune individual through blood products, for example, in immunoglobulin or antiserum therapy. LAB can be used as a vehicle for passive immunization by engineering them to produce specific antibodies. LAB producing single-chain variable fragment (scFv) antibodies (chimeric molecules that fuse two different regions of both heavy and light immunoglobulin chains) (Harmsen and De Haard, 2007) have been developed in an attempt to provide passive protection against different diseases of the GIT and other organs (Shiroza et al., 2003; Giomarelli et al., 2004; Monedero et al., 2004; Chancey et al., 2006; Marcotte et al., 2006; Yuvaraj et al., 2008; Wells, 2011; Thueng-in et al., 2014; Michon et al., 2015; Marcobal et al., 2016; Wang et al., 2016). After being orally administered in the corresponding animal model, passive immunoprotection developed against gastrointestinal infections caused by C. albicans (Oggioni et al., 2001), Streptococcus mutans (Kruger et al., 2002, 2005), norovirus (Hoang et al., 2015), and against anthrax edema toxin (Andersen et al., 2011). In addition to conventional immunoglobulin G (IgG) antibodies, the serum of llamas, camels, and dromedaries has antibodies with two identical heavy chains but no light chains (Hamers-Casterman et al., 1993; Muyldermans, 2013). The variable domains of these heavy chains are recognized as a new class of antibody fragment: VHH antibody fragments (also known as nanobodies or single-domain antibodies [sdAbs]; hereafter referred to simply as VHH). These have many advantages over conventional monoclonal antibodies (mAb) and scFv, which has encouraged research into their use possible clinical agents, either in purified form or delivered by VHH-producing live systems. Despite their small size – 12–15 kDa compared to the 150 kDa of traditional antibodies – VHH can recognize and bind to haptens, oligopeptides, and proteins. Indeed, they are the smallest fragments that retain the full antigen-binding capacity of antibodies. Their small size and structural properties allow them to behave like drugs and invest them with unique advantages over mAb for use in biotechnological and biomedical applications (Harmsen and De Haard, 2007; Goldman et al., 2017; Eden et al., 2018). For example, VHH are of low immunogenicity because of their notable sequence similarity with the VHIII subset family of human VH (Cortez-Retamozo et al., 2002; Su et al., 2002; Baral et al., 2006). They also show good solubility and little tendency to aggregate due to the presence of polar and charged amino acid residues (Siontorou, 2013); they exhibit potent-binding capacity (Muyldermans et al., 2001) and have a high affinity for their antigens (Muyldermans et al., 2001). VHH antibody fragments also show remarkably high-conformational stability and can fully reverse the unfolding process induced by denaturing agents and conditions (such as those encountered in the stomach). They can also resist high pressures and urea and guanidinium chloride concentrations (Dumoulin et al., 2002), are extremely stable at high temperatures (below 50 to over 80°C) (van der Linden et al., 1999; Dumoulin et al., 2002), and remain functional under low pH conditions (as low as pH 2) (van der Vaart et al., 2006). Protein engineering has improved the refolding capacity of VHH and therefore their stability under such denaturing conditions (Goldman et al., 2017). In addition to the conformational stability of VHH, the paratope of these antibody fragments (i.e., the region of the antibody that binds to an epitope) occupies such a small part of the antibody that the recognition of hidden regions of epitopes, hardly accessible to mAb, becomes possible (Muyldermans et al., 2001). Further, and in contrast to mAb, VHH can act as potent and specific enzyme inhibitors since they can access protein cavities and bind to the active site (Lauwereys et al., 1998). Moreover, VHH penetrate tissues much better than mAb and can therefore target solid tumors and metastatic lesions much more effectively (Cortez-Retamozo et al., 2002). The single-domain nature of VHH allows for the easy cloning of VHH-encoding genes, as well as the generation of multimeric VHH using the same or different building blocks. Multivalent VHH are created when two or more identical target-binding VHH are combined. In addition, multiparatopic or multispecific VHH can be created by combining different VHH targeting different antigens or different epitopes of the same antigen (Els Conrath et al., 2001; Harmsen and De Haard, 2007; Hultberg et al., 2011). Increasing the valency and specificity of VHH enhances their therapeutic efficacy, potency, and cross reactivity over that of monovalent and monospecific VHH (Hultberg et al., 2011; Huet et al., 2014). These beneficial properties of VHH have boosted their use in the detection of toxins in foods (Xu et al., 2015; Wang et al., 2018), in disease diagnosis (De Meyer et al., 2014; Hu et al., 2017; Leow et al., 2017), in pathogen detection (Saerens et al., 2008; Abbady et al., 2012), and in the treatment of different diseases in humans (Hu et al., 2017) and animals (Harmsen et al., 2009; Liu et al., 2015). The following lines focus on their use in the treatment of non-infectious and infectious diseases of the human GIT. VHH have been used to combat GIT inflammatory diseases, infections, and cancers (Steeland et al., 2016). Over the last decade, interest has increased in developing VHH antibodies that target proteins involved in inflammation as a means of treating gastrointestinal inflammatory diseases, including IBD (Steeland et al., 2016). Bradley et al. (2015) generated a biparatopic VHH against the chemokine receptor CXCR2, a G-protein-coupled receptor that plays an important role in mediating the chemotaxis of neutrophils to sites of inflammation, which is involved in a variety of acute and chronic inflammatory diseases, including IBD, asthma, fibrosis, psoriasis, and rheumatoid arthritis (Stadtmann and Zarbock, 2012). This recognized two different epitopes, allowing it to act as an inverse agonist and inhibitor of CXCR2 signaling in vitro – a promising strategy for treating inflammatory diseases. VHH have also been directed against bacterial pathogens and their toxins. The intensive clinical and agricultural use of antibiotics has favored the emergence of multi-resistant pathogens that cause difficult-to-treat or even un-treatable healthcare-associated and community-acquired infections (Watkins and Bonomo, 2016; Frieri et al., 2017). There is therefore an urgent need to develop non-antibiotic antimicrobial agents to combat these pathogens. VHH have been designed to target different bacterial pathogens of the gut (or their toxins) (Steeland et al., 2016), for example, against S. mutans, the main cause of dental caries (Nakano et al., 2010). The oral administration of VHH targeting streptococcal antigen I/II (SA I/II), a cell wall-anchored adhesin present on the bacterial surface, reduced the development of smooth surface caries in a rat-desalivated caries model, probably by blocking the binding of the bacteria to the enamel pellicle (Kruger et al., 2006). VHH have also been developed against Campylobacter jejuni, a zoonotic pathogen that causes foodborne gastroenteritis worldwide (Kaakoush et al., 2015). An orally administered pentameric VHH directed against the flagella of this pathogen (a major virulence factor) reduced its motility in vitro and significantly reduced colonization in infected chickens (Riazi et al., 2013). VHH have also been raised against H. pylori, a common pathogen that causes gastritis, gastric and duodenal ulcers, gastric cancer, and other gastrointestinal diseases (Venerito et al., 2015). Some VHH target an important virulence factor, in this case the pathogen’s urease enzyme (Ardekani et al., 2013; Hoseinpoor et al., 2014). This hydrolyses urea into ammonia, helping to neutralize the gastric acid in the bacteria’s environment and aiding their colonization of the epithelium (Marshall et al., 1990; Olivera-Severo et al., 2017). These neutralizing VHH were resistant to pepsin and trypsin, an important trait for any VHH to be used in the treatment of H. pylori infection. Other VHH antibodies have also been generated to target the botulinum neurotoxins of Clostridium botulinum (Dong et al., 2010; Mukherjee et al., 2012; Bakherad et al., 2013; Yao et al., 2017), the shiga toxins produced by shiga toxin-producing E. coli strains (STEC) (Tremblay et al., 2013; Mejias et al., 2016), and toxin A (TcdA), toxin B (TcdB), and binary toxin (CDT) of C. difficile (Hussack et al., 2011; Yang et al., 2014; Unger et al., 2015). VHH have also shown a promise against human viral diseases (Vanlandschoot et al., 2011; Wu et al., 2017). Some have been designed to block the entry of viruses into the host cells by targeting the viral envelope proteins, while others target essential intracellular viral proteins (Wu et al., 2017). These agents have shown a particular promise against rotavirus and norovirus (Ghosh et al., 2018), the most common causes of severe acute gastroenteritis in children (Riera-Montes et al., 2017). Several VHH generated against Group A rotavirus (RVA) strains were shown to neutralize rotavirus in vitro and provided different degrees of in vivo passive protection against rotavirus challenge when orally administered in a neonatal mouse model (van der Vaart et al., 2006; Garaicoechea et al., 2008; Gómez-Sebastián et al., 2012; Tokuhara et al., 2013; Maffey et al., 2015). They also provided protection against human RVA-induced diarrhea in gnotobiotic piglets (Vega et al., 2013). The therapeutic efficacy of an anti-rotavirus VHH known as ARP1 (ARP: anti-rotavirus protein) has been demonstrated in a randomized placebo-controlled clinical trial (Clinicaltrials.gov number: NCT01259765). The oral administration of purified ARP1 to children with severe rotavirus-associated diarrhea reduced the stool output (Sarker et al., 2013). VHH have also been raised against the two major norovirus genogroups (GI and GII) (Garaicoechea et al., 2015; Koromyslova and Hansman, 2015, 2017), with some showing promise in in vitro surrogate neutralization assays (Garaicoechea et al., 2015). Anti-rotavirus and anti-norovirus VHH would therefore appear to have a great potential as immunotherapeutic agents in infections caused by these pathogens. VHH are gaining importance as anti-tumoral agents. Their small size, tumor penetrating capacity, and homogeneous distribution compared to mAb can lead to improved treatment results, and even tumor eradication (Bannas et al., 2015). In addition, the discovery and production costs for VHH are lower than those associated with mAb, perhaps allowing for more affordable and sustainable cancer treatments. The absence in VHH of the fragment crystallizable (Fc) region of IgG, which is present in mAbs, might also reduce the adverse immune responses associated with this domain (Steeland et al., 2016). However, its absence might also reduce the efficacy of VHH in cancer treatment (Steeland et al., 2016; Hu et al., 2017) since it triggers the antibody-dependent cellular cytotoxicity (ADCC) and complement-dependent cytotoxicity (CDC) reactions upon antigen binding; both are important in tumor eradication (Weiner et al., 2010). These findings have together boosted the search for VHH anti-tumoral agents (Oliveira et al., 2013; Kijanka et al., 2015; Steeland et al., 2016; Hu et al., 2017; Iezzi et al., 2018). The growth of certain gastrointestinal tumors has already been reported to be reduced by some VHH (Cortez-Retamozo et al., 2004; Rozan et al., 2013). VHH have been designed to elicit the ADCC and CDC responses, such as a Fab-like bispecific antibody that comprised a VHH targeting the carcinoembryonic antigen (CEA; a well-characterized tumor marker of interest for mAb-based cancer therapy) and a VHH that specifically bound and activated the FcγRIIIa receptor (an Fc-receptor class with important anti-tumoral effects) (Rozan et al., 2013). This antibody triggered potent in vitro cell-mediated cytotoxicity toward different CEA-positive human tumor cell lines (including human colon adenocarcinoma and primary pancreatic adenocarcinoma lines) in the presence of natural killer cells used as effector cells. Further, it showed potent in vivo activity, inhibiting tumor growth after being injected intraperitoneally together with human peripheral blood mononuclear cells in mice xenografted with a CEA-positive pancreatic cell line. Other anti-tumoral VHH have been designed to block inhibitory immune checkpoints (Zhang et al., 2017). These are inhibitory pathways that under normal physiological conditions prevent autoimmunity and modulate immune response against microbial infections to prevent tissue damage (Tsai and Hsu, 2017). Some inhibitory immune checkpoints are upregulated in many cancers as a mechanism of tumor resistance to, and evasion of, the host immune system (Zou and Chen, 2008). Antibodies that block immunosuppressive checkpoints are therefore emerging as promising strategies (Pardoll, 2012; La-Beck et al., 2015; Singh et al., 2015; Shi et al., 2018). For example, immunotherapies based on the blockade of PD-1/PD-L1 (PD-1, or programmed death protein-1, is a surface cell receptor present in activated T-cells, and PD-L1, or ligand 1 of PD-1, is abundant in cells of colon cancer and other carcinomas) (Dong et al., 2002; Droeser et al., 2013) using anti-PD-1 (Lipson, 2013; Le et al., 2015, 2017; O’Neil et al., 2017) or anti-PD-L1 mAb (Herbst et al., 2014; Singh et al., 2015) have led to remarkable clinical responses in patients with colorectal cancer. In the context of VHH, Zhang et al. (2017) developed an intraperitoneally administered anti-PD-L1 nanobody fused to the Fc-domain of human IgG1 that efficiently inhibited the PD-1/PD-L1 interaction, induced the T-cell cytokine production in vitro, and caused the in vivo inhibition of tumor growth in a melanoma xenograft mouse model. Another immunotherapeutic strategy aimed at impeding the growth of gastrointestinal and other tumors is the use of antibodies targeting angiogenic factors. Angiogenesis, a process whereby new blood vessels are formed from existing vessels, is over-induced in tumors. The new vessels that form in the vicinity of the tumor provide it with nutrients and oxygen (Kong et al., 2017). VHH that block overproduced pro-angiogenic factors have been shown effective in preventing tumor angiogenesis and therefore offer a promise as anti-tumoral agents (Arezumand et al., 2017). VHH have been developed that target key regulators of tumor angiogenesis, such as vascular endothelial growth factor (VEGF) (Farajpour et al., 2014; Ebrahimizadeh et al., 2015; Kazemi-Lomedasht et al., 2015), placental growth factor (PLGF) (Arezumand et al., 2016), and vascular endothelial growth factor receptor 2 (VEGFR-2) (Behdani et al., 2012; Ghavamipour et al., 2014; Ma et al., 2016), among others (Arezumand et al., 2017). In addition, they have been directed against hepatocyte growth factor (HGF) and its receptor c-Met since HGF/c-Met-signaling is involved in angiogenesis and the progression of different gastrointestinal cancers, including colon and gastric cancers (Birchmeier et al., 2003; Kijanka et al., 2015; Arezumand et al., 2017). A VHH targeting HGF reduced the growth of solid tumors in mice bearing glioblastoma xenografts (interestingly, some mice were even cured) (Vosjan et al., 2012), while an anti-c-Met VHH efficiently inhibited cell proliferation, adhesion, and in vitro migration in HGF-mediated multiple myeloma (Slordahl et al., 2013). VHH that target angiogenic factors may therefore have a bright future as anti-tumoral/anti-metastatic immunotherapeutic agents. The small size and the hydrophilic and single-domain nature of VHH allow for their easy production in different eukaryotic systems, including yeasts (e.g., Saccharomyces cerevisiae and Pichia pastoris), fungi (e.g., Aspergillus awamori and Aspergillus oryzae), plants (e.g., Nicotiana benthamiana and Arabidopsis thaliana), mammalian cell lines [e.g., Chinese hamster ovary (CHO) cells and mouse B cells], and insect cells (e.g., those of Spodoptera frugiperda and Trichoplusia ni). They can also be produced in prokaryotic microorganisms, including Gram-negative bacteria such as E. coli, Gram-positive bacteria such as Brevibacillus choshinensis, some species of LAB, and species belonging to the genus Bifidobacterium (Harmsen and De Haard, 2007; Liu and Huang, 2018). The eukaryotic systems allow for the production of soluble, functional, and N-glycosylated VHH, although degradation by proteases and inefficient secretion can reduce the yield obtained. It should be remembered, however, that some of these systems, for example, mammalian cells, are quite expensive for use in large-scale production (Liu and Huang, 2018). In addition, they cannot be used for the in situ delivery of the VHH produced. Prokaryotic systems are therefore preferable. These can be genetically manipulated with relative ease and are more economically viable as production systems. 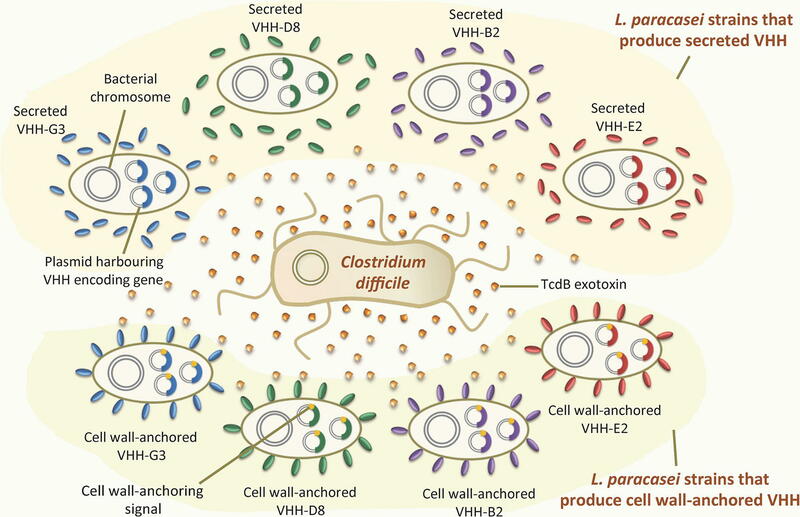 E. coli is one of the microbial hosts most widely used for VHH production (Liu and Huang, 2018). However, it has some limitations. The reducing environment of its cytoplasm, for example, drives the incorrect folding of VHH and the formation of insoluble and non-functional aggregates (Liu and Huang, 2018). In addition, the presence of LPS in the bacterial membrane – which is pyrogenic in humans and other mammals (Mamat et al., 2015) – limits its use as a host. In contrast, Gram-positive bacteria, including the LAB, have no LPS in their cell membranes (Malanovic and Lohner, 2016). This, plus the other characteristics of LAB mentioned earlier, renders this group a better alternative when producing VHH for therapeutic use. This is particularly true when they are to be orally administered as live systems for delivering VHH to the GIT (Pant et al., 2006, 2011; Vandenbroucke et al., 2010; Martin et al., 2011; Alvarez et al., 2015; Andersen et al., 2015). L. lactis is one of LAB species of choice for such a delivery system. This non-pathogenic bacterium can be safely consumed; indeed, it has been used for centuries in food fermentation and preservation without raising any safety concerns, and it has been granted QPS status by the EFSA (Ricci et al., 2018) and GRAS status by the FDA (Wells and Mercenier, 2008). In addition, it is a non-invasive, non-colonizing bacterium (Steidler et al., 2000), and many genetic engineering tools are available that can induce its production of a wide range of heterologous proteins (Song et al., 2017). These advantages make L. lactis a successful microbial cell factory and have prompted its use as a vehicle for delivering therapeutic molecules directly into the GIT (Song et al., 2017). Other LAB – specifically the members of the genus Lactobacillus – have been engineered to produce VHH directly in the GIT. These have extra advantages as VHH delivery vehicles. In addition to being safe for consumption, many Lactobacillus strains are normal constituents of the human gut microbiota and can survive passage to the intestine since they are resistant to gastric and bile acids. They also transiently adhere to the mucosal epithelium and have intrinsic immunostimulatory properties (Alvarez-Sieiro et al., 2014; del Rio et al., 2014). Moreover, some Lactobacillus strains have probiotic characteristics and are beneficial to health (Azad et al., 2018). For instance, L. rhamnosus GG, L. casei Shirota YIT9029, and L. casei DN-114001, among others, have antimicrobial effects against gastric and enteric bacterial pathogens and rotavirus (Lievin-Le Moal and Servin, 2014). Moreover, many genetic engineering tools, such as plasmid-based cloning systems, are available to help generate recombinant Lactobacillus strains capable of producing heterologous proteins (Landete, 2017). Other technologies conferring selective advantages over the use of plasmids are also available, such as genome editing for the stable integration of expression cassettes in the bacterial chromosome (based on the integrative machinery of bacteriophages) (Martin et al.1, 2000, 2011; Lin et al., 2013; Alvarez-Sieiro et al., 2014), systems based on integration by double recombination (Gosalbes et al., 2000; Steidler et al., 2003; Douglas and Klaenhammer, 2011), and technologies based on clustered regularly interspaced short palindromic repeats (CRISPR) and associated (Cas) proteins (CRISPR/Cas) (Hidalgo-Cantabrana et al., 2017; van Pijkeren and Barrangou, 2017). Lactobacillus is currently regarded as the most suitable LAB genus for the oral delivery of VHH against diseases of the GIT. Indeed, Lactobacillus paracasei was the first LAB species engineered to produce VHH, which were termed as “lactobodies” (Pant et al., 2006). The following lines provide a comprehensive review of all the recombinant LAB that have been genetically engineered to deliver VHH antibodies in situ at the GIT mucosa. Tumor necrosis factor alpha (TNFα) is one of the major cytokines involved in the pathogenesis of IBD (Billmeier et al., 2016), and immunotherapy with anti-TNFα antibodies is becoming recognized as an efficient treatment (Billmeier et al., 2016). Vandenbroucke et al. (2010) developed recombinant L. lactis strains that secreted monovalent (MT1) and bivalent (MT1-MT1; constructed using two MT1 and a llama IgG2a upper hinge) (Coppieters et al., 2006) VHH against murine TNFα (Figure 1 ). Both the MT1 and (especially) the MT1-MT1 VHH neutralized the soluble and the transmembrane forms of TNFα in vitro. The same study revealed the in vivo therapeutic efficacy of orally administered recombinant L. lactis secreting MT1-MT1 in terms of reducing the symptoms of chronic colitis in two mouse models (DSS-induced colitis and established colitis in IL-10−/− mice). Importantly, the study also showed that the production of MT1-MT1 at the site of inflammation avoided the increase in the incidence of systemic viral and bacterial infections sometimes observed after the intravenous administration of purified anti-TNFα IgG1 antibodies. This result is of great importance since current treatments for Crohn’s disease and ulcerative colitis involve the intravenous administration of anti-TNFα IgG1 antibodies (Colombel et al., 2004; Zabana et al., 2010). The oral administration of anti-TNFα VHH-producing L. lactis provides a way of treating chronic GIT inflammation locally, avoiding the adverse effects associated with systemically administered anti-TNFα antibodies. Figure 1. Recombinant LAB that produce VHH against intestinal inflammatory bowel diseases. Recombinant Lactococcus lactis strains secreting either monovalent MT1 or bivalent MT1-MT1 VHH against TNFα, an inflammatory cytokine involved in inflammatory bowel disease. The gene encoding MT1 VHH is constitutively expressed within a replicative plasmid either as a single copy (monovalent form, MT1 VHH) or as two copies in tandem (bivalent form, MTI-MT1 VHH). Lactobacilli have been engineered to produce VHH to combat gastrointestinal infections caused by C. difficile, the leading cause of nosocomial infections in healthcare settings (Aktories et al., 2017), and of most antibiotic-associated diarrheal disease. It is also a causal agent of pseudomembranous colitis, megacolon, and chronic infections and can even cause death (Aktories et al., 2018). C. difficile produces two secreted enzymatic exotoxins TcdA and TcdB (Aktories et al., 2017); these are major virulence factors of this bacterium and are clearly responsible for associated diarrhea and colitis (Chandrasekaran and Lacy, 2017). TcdA and TcdB exert their effects by binding to surface receptors on intestinal epithelial cells (Aktories et al., 2017). Andersen et al. (2015) proposed an oral antitoxin strategy for the prevention and treatment of C. difficile-associated diarrhea, based on the neutralization of TcdB using engineered L. paracasei BL23 that constitutively produced anti-TcdB VHH in the GIT (Figure 2 ). These authors generated several recombinant L. paracasei strains that produced neutralizing anti-TcdB VHH that targeted different epitopes of the exotoxin. The bacteria were engineered to either secrete anti-TcdB VHH into the extracellular medium or produce them anchored to the cell wall. Both types neutralized TcdB in vitro. Importantly, the oral administration of a combination of two strains displaying different cell wall-anchored anti-TcdB VHH delayed the development of C. difficile infection and provided partial protection in a hamster protection model (Andersen et al., 2015). These results confirmed the prophylactic effect of such VHH against this pathogen. It should also be noted, however, that the oral administration of purified anti-TcdB VHH produced by a yeast provided no such protection in vivo, probably due to the proteolytic degradation of the antibodies under the harsh conditions of the GIT (Vandenbroucke et al., 2010). These results highlight the advantages of the continuous production of neutralizing VHH anchored to the cell wall and acting in situ in the GIT: this system avoids the degradation suffered by purified VHH and might prevent the diffusion of the toxin by sequestering it on the bacterial surface. Engineered lactobacilli producing surface-exposed anti-TcdB VHH might be used to complement existing therapies designed to tackle C. difficile infection. Figure 2. Recombinant LAB that produce VHH against the TcdB exotoxin of Clostridium difficile. Recombinant Lactobacillus paracasei strains producing four different VHH (G3, D8, B2, and E2) against the TcdB exotoxin of Clostridium difficile. Some of these strains secrete the VHH into the extracellular environment, while others produce it covalently attached to the cell wall. The VHH-encoding genes are constitutively expressed within replicative plasmids inside the L. paracasei cells. Most of the lactobacilli engineered to produce VHH have been developed to treat or provide protection against rotavirus infection (Figure 3 ). Pant et al. (2006) proposed an oral prophylactic therapy to prevent rotavirus-associated diarrhea based on engineered Lactobacillus that produced anti-rotavirus VHH in situ in the GIT. This was the first time that lactobacilli were successfully engineered to produce VHH. Using a plasmid expression system, L. paracasei was engineered to constitutively express secreted or cell wall-anchored VHH1 (referred to as anti-rotavirus proteins [ARP1] in the present work), a VHH antibody that targets the RRV strain of rhesus monkey rotavirus serotype G3 (RRV). The study showed that both VHH1-secreting lactobacilli and VHH1-anchored lactobacilli bound and neutralized rotavirus in vitro in a dose-dependent manner. Moreover, VHH1-anchored lactobacilli were able to survive and constitutively produce VHH1 antibodies in situ in the jejunum and ileum after being orally administered to both uninfected and RRV-infected mice. The results highlighted the better performance of VHH1-anchored lactobacilli in preventing rotavirus infection and rotavirus-associated diarrhea in a mouse pup model of rotavirus infection. The good prophylactic effect observed was probably due to the numerous anti-rotavirus VHH antibodies exposed on the bacterial surface; these likely increased affinity for the viral particles, enhanced their agglutination, and facilitated their subsequent clearance. The same study also showed that recombinant VHH1-anchored lactobacilli maintain their protective activity after they are lyophilized and reconstituted. They can therefore be stored in lyophilized format, eliminating the dependence on a cold chain for their preservation, with all the advantages this brings. Figure 3. Recombinant LAB that produce VHH against rotavirus. A recombinant Lactobacillus paracasei strain with ARP1, targeting rhesus-monkey rotavirus serotype G3, anchored to its cell wall. The expression cassette harboring the gene encoding ARP1 is fused to a cell wall-anchoring signal sequence and is stably integrated within the bacterial chromosome. In a later study, Pant et al. (2011) showed that increasing the specificity of anti-rotavirus VHH improves the prophylactic and therapeutic effects of orally administered recombinant lactobacilli. These authors generated different recombinant L. paracasei strains that produced anti-rotavirus VHH with different valency formats (monovalent and bivalent VHH) and specificity (monospecific and bispecific VHH) that recognized different epitopes of the viral particle and that cross-reacted with and cross-neutralized different rotavirus serotypes in vitro (Pant et al., 2011; Aladin et al., 2012). These strains produced either: 1) cell wall-anchored monovalent, monospecific ARP1 (referred to as VHH1 in the original study) or anti-rotavirus protein 3 (ARP3), 2) bivalent, monospecific ARP1-ARP1, ARP3-ARP3, or 3) bivalent, bispecific ARP1-ARP3 proteins. Although all the strains producing anchored VHH bound to the RRV strain in vitro, the bispecific ARP1-ARP3 format returned the best results. In addition, the latter neutralized RRV in vitro and reduced the infection rate. This strain showed the greatest in vivo prophylactic effect after being orally administered in a mouse pup model of rotavirus infection. In addition, in therapeutic use, it most strongly reduced the prevalence, severity, and duration of diarrheal disease. The generation of recombinant lactobacilli producing multivalent and multispecific VHH against rotavirus might improve their prophylactic and therapeutic efficacy against a broad range of viral serotypes. More recently, Gunaydin et al. (2014) developed several expression cassettes that were cloned in tandem to allow the co-expression of ARP1 and ARP3 as either secreted or cell wall-anchored forms in L. paracasei BL23. Using these cassettes, they generated three recombinant strains: L. paracasei pAF1300 producing secreted ARP1 and anchored ARP3, L. paracasei pAF1400 producing anchored ARP1 and ARP3, and L. paracasei pAF1200 producing secreted ARP1 and ARP3. Those producing ARP1 and ARP3 in anchored form bound a broad range of human and simian rotavirus serotypes with great affinity. Secreted ARP1 produced by L. paracasei pAF1300 and L. paracasei pAF1200 and secreted ARP3 produced by L. paracasei pAF1200 bound to different human rotavirus serotypes and simian rotavirus RRV. Analysis of the mechanism of interaction between rotavirus and L. paracasei pAF1300 suggested that once the virus is captured by anchored ARP3, the bacterium produces secreted ARP1, which targets other rotavirus epitopes. This confirms the feasibility of engineering Lactobacillus to co-produce VHH with different specificities and cell locations, increasing the chances of neutralizing different rotavirus serotypes and reducing the chances of escape mutants appearing. Moreover, the simultaneous production of several VHH with different specificities in one engineered Lactobacillus would considerably reduce production costs compared to preparing cocktails of different recombinant lactobacilli, each producing different VHH. The recombinant lactobacilli described in the above-mentioned studies relied on plasmid expression systems for the production and delivery of anti-rotavirus VHH. These systems have been widely used to overproduce heterologous proteins in LAB, but they suffer drawbacks that hamper their use as delivery systems for the in situ production of therapeutic proteins in the GIT. For instance, expression plasmids show structural and segregational instability, and their maintenance in cells therefore requires a selection pressure, commonly resistance to antibiotics. The presence of antibiotic resistance genes in therapeutic recombinant lactobacilli, however, is undesirable since antibiotics would be needed to select VHH-producing strains in the intestine. In addition, they would increase the risk of antibiotic resistance genes being horizontally transferred to other, perhaps pathogenic, GIT bacteria. Given the above, different approaches have been proposed to maintain heterologous genes in recombinant LAB. A feasible alternative is the use of food-grade expression vectors with selection markers other than antibiotics that provide new phenotypes (e.g., immunity to bacteriocins, utilization of rare sugars, etc.) or complement specific mutations that restore impaired functions (e.g., complementation of auxotrophic mutants depending on threonine, thymidine, alanine, lactose, etc.) (Landete, 2017). But in any case, it is necessary to maintain a selective pressure in the GIT, which can be avoided by the chromosomal integration of the heterologous genes. Martin et al. (2011) developed a universal integrative expression system that allows the stable integration of expression cassettes for the production of scFv and VHH in the chromosome of Lactobacillus. This system is based on an ingenious genome editing technology, developed by Martin et al. (2000), that involves the site-specific integration of heterologous genes into the LAB chromosome, plus a purification system that – once the vector is integrated into the chromosome – leads to the elimination of all non-food-grade deoxyribonucleic acid, including the antibiotic selection genes. This system allowed the generation of different food-grade recombinant L. paracasei strains that stably produce VHH against rotavirus (Martin et al., 2011). The recombinant L. paracasei EM233 strain, which stably produces cell wall-anchored ARP1 (Figure 3 ), was shown to effectively bind rotavirus in vitro, and importantly, the integrated gene encoding APR1 VHH antibody was stable with no need for any selective pressure. After its oral administration, the recombinant L. paracasei strain producing anchored ARP1 showed prophylactic efficacy, reducing the duration and severity of diarrhea in a mouse model of rotavirus infection. More recently, L. rhamnosus GG was genetically engineered using this system to stably produce cell wall-anchored ARP1 antibody against rotavirus (Alvarez et al., 2015). L. rhamnosus GG is a well-known probiotic strain that, in addition to having intrinsic anti-rotavirus activity (Lievin-Le Moal and Servin, 2014; Guarino et al., 2015), helps reinforce the intestinal barrier, triggers the innate and adaptive immune responses (Sindhu et al., 2014), and transiently colonizes the intestine (Alander et al., 1999). It is therefore an ideal vehicle for the production of VHH against rotavirus in the GIT mucosa. Alvarez et al. (2015) tested the capacity of several L. rhamnosus GG strains to display anchored ARP1 on their surfaces for which they used the plasmid-based expression system described above (Martin et al., 2011). Although all these strains produced ARP1, only one, a naturally occurring exopolysaccharide-deficient mutant strain named L. rhamnosus GG (UT), efficiently produced anchored ARP1. Genomic analysis suggested that two genes (welE and welF) belonging to the exopolysaccharide (EPS) cluster were inactive in this strain, which impaired the production of cell-bound EPS. The EPS deficiency allowed the appearance of the anchored ARP1; in all the other strains tested the thick layer of EPS masked it. L. rhamnosus GG (UT) was further genetically engineered to produce ARP1 anchored to the cell wall through the use of the above-described integrative-expression system (Martin et al., 2011). This strain, known as L. rhamnosus GG EM233, bounded rotavirus particles and seemed to confer a protective effect in vivo; when it was orally administered to mice before they were infected with rotavirus, the prevalence, duration, and severity of diarrhea were reduced compared to the control group (Alvarez et al., 2015). Thus, the oral administration of engineered lactobacilli that either secrete VHH or display cell wall-anchored VHH (with single or multiple valencies and specificities) may be a way of preventing or treating rotavirus infection and its associated diarrhea. The site-specific integration expression technology used in the above studies represents an important advance in the genetic manipulation of LAB for the generation of food-grade, live recombinant bacteria that produce prophylactic and therapeutic VHH in situ in the GIT. Over the last decade, LAB have emerged as powerful oral delivery vectors for the in situ production of VHH at the GIT mucosa where they may act as therapeutic agents or provide passive protection against different gastrointestinal diseases. Specific LAB strains have been genetically modified to either secrete VHH or produce them anchored to their surfaces. This has been achieved using expression systems based on replicative plasmids, which require a selection pressure such as the presence of antibiotic resistance genes for their maintenance in bacteria (Pant et al., 2006, 2011; Vandenbroucke et al., 2010; Gunaydin et al., 2014; Andersen et al., 2015) or by using other genetic tools that allow the integration of VHH-encoding genes into the bacterial chromosome. This provides stability to the integrated gene without the need for a selection pressure system (Martin et al., 2011; Alvarez et al., 2015). In the near future, other powerful chromosome editing technologies, such as those based on the CRISPR/Cas systems (Hidalgo-Cantabrana et al., 2017), might also be used to generate recombinant LAB that stably produce VHH against diseases of the GIT. At the time of writing, only L. lactis (Vandenbroucke et al., 2010), L. paracasei (Pant et al., 2006, 2011; Martin et al., 2011; Gunaydin et al., 2014; Andersen et al., 2015), and L. rhamnosus (Alvarez et al., 2015) have been engineered to produce VHH for treating or preventing GIT disease. Many LAB strains have been described as possessing probiotic characteristics of benefit against IBD (Saez-Lara et al., 2015), and against the bacteria (Goderska et al., 2018; Lin et al., 2018; McFarland et al., 2018) and viruses (Guarino et al., 2015) that cause gastrointestinal infections. Some of them even show anti-tumoral properties against colorectal cancer (Ambalam et al., 2016). Based on their intrinsic benefits, specific probiotic LAB strains could be selected and genetically modified to produce therapeutic or prophylactic VHH. This would result in a synergistic effect against the target disease. So far, recombinant LAB that produce VHH have been directed to prevent or treat IBD (Vandenbroucke et al., 2010) and infections caused by C. difficile (Andersen et al., 2015) and rotavirus (Pant et al., 2006, 2011; Martin et al., 2011; Gunaydin et al., 2014; Alvarez et al., 2015). Given the great potential of VHH as therapeutic and prophylactic agents, many other LAB might be engineered to produce VHH targeting other diseases of the GIT, such as infections caused by pathogenic bacteria (e.g., C. jejuni, H. pylori, ETEC, STEC, Salmonella, etc. ), viruses (e.g., norovirus), fungi (e.g., C. albicans), and intestinal parasites and to provide relief from food allergies and intolerances, inflammatory diseases, and even gastrointestinal cancers. They might also be produced to treat disease in other mucous membranes inhabited by LAB. This work was funded by the Spanish Ministry of Economy and Competitiveness (AGL2016-78708-R). The authors thank Adrian Burton for linguistic assistance. We acknowledge support of the publication fee by the CSIC Open Access Publication Support Initiative through its Unit of Information Resources for Research (URICI). Alander, M., Satokari, R., Korpela, R., Saxelin, M., Vilpponen-Salmela, T., Mattila-Sandholm, T. , et al. (1999). Persistence of colonization of human colonic mucosa by a probiotic strain, Lactobacillus rhamnosus GG, after oral consumption. Appl. Environ. Microbiol. 65, 351–354. de Ruyter, P. G., Kuipers, O. P., and de Vos, W. M. (1996). Controlled gene expression systems for Lactococcus lactis with the food-grade inducer nisin. Appl. Environ. Microbiol. 62, 3662–3667. del Rio, B., Martín, M. C., Sarmiento, M. E., Acosta, A., and Alvarez, M. A. (2014). “Lactobacilli as live vectors for oral vaccination against TB,” in The art and science of tuberculosis vaccine development . eds. Norazmi, M. N., Acosta, A., and Sarmiento, M. E. (Shah Alam, Selangor, Malaysia: Oxford University Press), 794–811. FAO/WHO. (2006). Probiotics in food. Health and nutritional properties and guidelines for evaluation . Rome: FAO Food Nutrition. Norton, P. M., Wells, J. M., Brown, H. W., Macpherson, A. M., and Le Page, R. W. (1997). Protection against tetanus toxin in mice nasally immunized with recombinant Lactococcus lactis expressing tetanus toxin fragment C. Vaccine 15, 616–619. van der Linden, R. H., Frenken, L. G., de Geus, B., Harmsen, M. M., Ruuls, R. C., Stok, W. , et al. (1999). Comparison of physical chemical properties of llama VHH antibody fragments and mouse monoclonal antibodies. Biochim. Biophys. Acta 1431, 37–46. Wells, J. M., Wilson, P. W. , Norton, P. M. , Gasson, M. J., and Le Page, R. W. (1993). Lactococcus lactis: high-level expression of tetanus toxin fragment C and protection against lethal challenge. Mol. Microbiol. 8, 1155–1162. Copyright © 2019 del Rio, Redruello, Fernandez, Martin, Ladero and Alvarez. This is an open-access article distributed under the terms of the Creative Commons Attribution License (CC BY). The use, distribution or reproduction in other forums is permitted, provided the original author(s) and the copyright owner(s) are credited and that the original publication in this journal is cited, in accordance with accepted academic practice. No use, distribution or reproduction is permitted which does not comply with these terms.